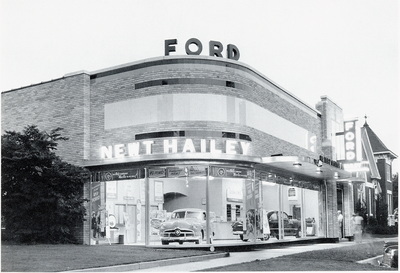 Newt Hailey bought the Ford dealership in Rogers in 1935 at 314 S. First Street (now a vacant lot) when he purchased the Davis Motor Company. Hailey introduced the Mercury car line into the company in 1939. 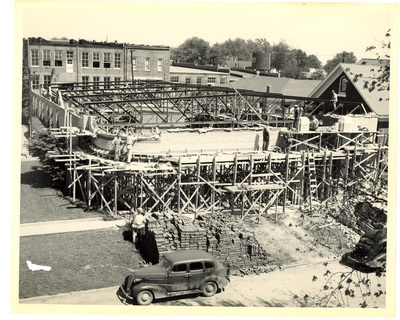 In 1947, Newt Hailey built a new home for Hailey Motor Company which was one of the most beautiful business buildings in Rogers. 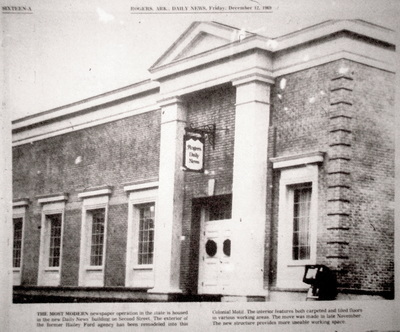 The building at 313 S. Second Street (now the Morning News) housed the Ford/Mercury automobile and truck sales and service departments. Hailey sold the dealership to a group of investors headed by James D. Yates in March 1961. The name of the new company became Benton County Motors and remained on S. Second Street. (Rogers Daily News, 3-2-61) In1964, Benton County Motors advertised the new Mercury Monterey starting at $2920. 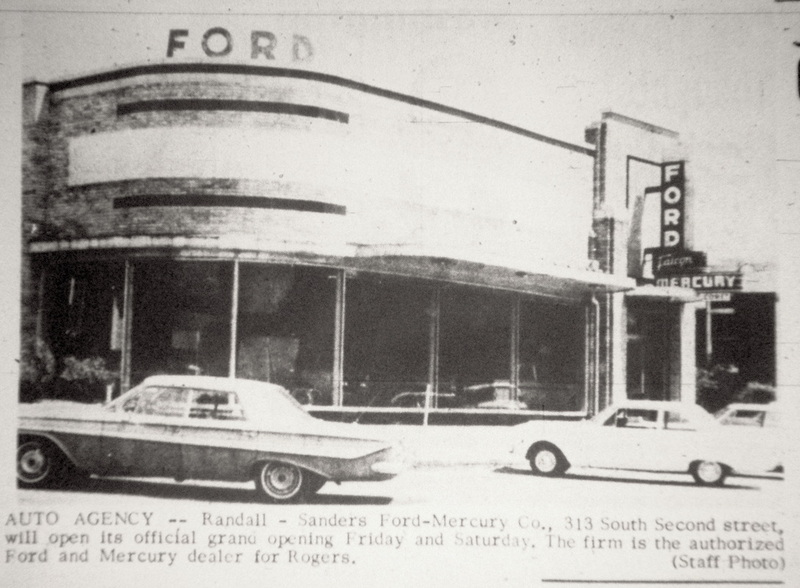 The dealership again changed names in May 1965 when it became Randall-Sanders Ford-Mercury. It was owned by Clyde Randall from Fort Smith and managed by Bob Sanders. In 1967, you could buy a brand new Mustang Hardtop for only $2461.46. 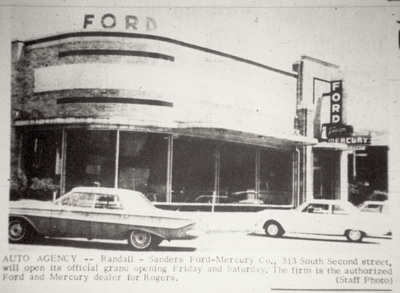 On July 31, 1967, Randall-Sanders Ford moved from downtown into new facilities on the southwest corner of Highway 71 and New Hope Road. The Ford dealership on S. Second Street was an important part in the lives of Rogers’ citizens for the two decades that it flourished, not only for those buying new autos but for the many folks who worked there. 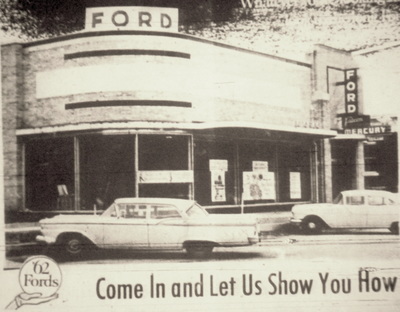 Here are just a few of the prominent folks employed at various times at the Ford dealership: Clyde Weaver, J.S. Grambling, Buddy Wright, Shawn Wright, Ray Buttram, David Thrasher, Cecil Rose and Russell Spicer. 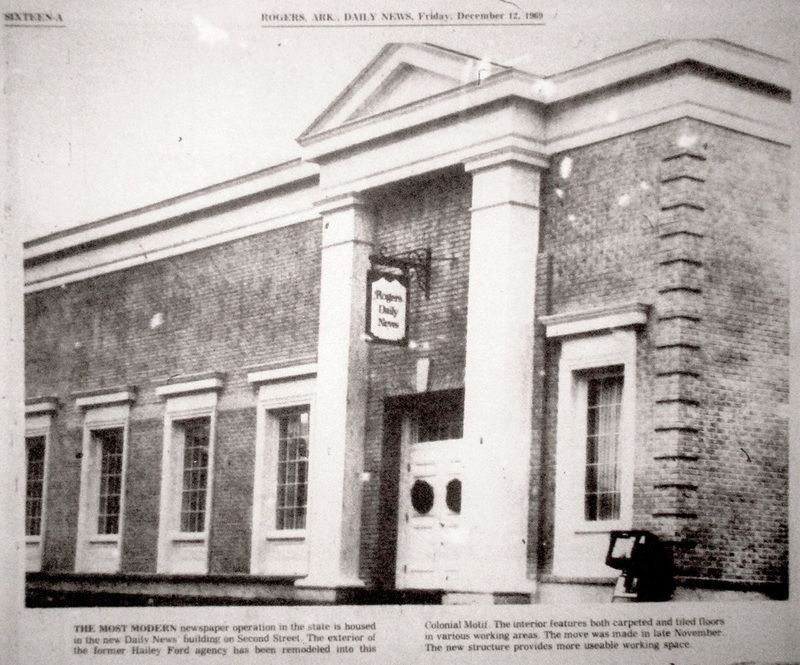 The Rogers Daily News bought the Newt Hailey Ford building, renovated it, and moved in on November 24, 1969. The name and ownership of the newspaper has changed several times through the years and in 2000 became the Morning News. The newspapers of Northwest Arkansas consolidated earlier this year into the Northwest Arkansas Democrat Gazette and closed the Rogers branch of the newspaper housed in the historic Hailey Ford/Morning News building. The vacant building was made available for sale and after inspections, analysis, and study by Rogers Historical Museum staff and city officials, Mayor Greg Hines immediately began the negotiations to acquire the property for the city. 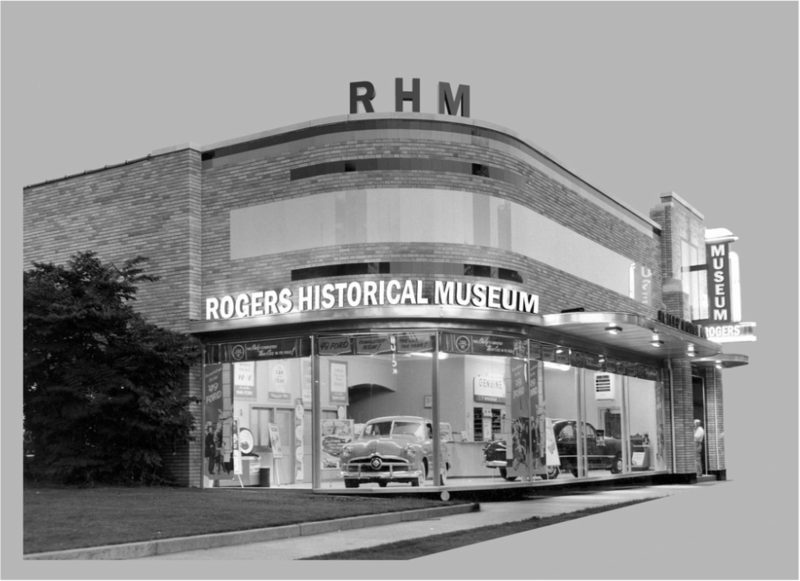 The City of Rogers has a contract with the owners, Northwest Arkansas Newspapers, and should receive possession soon to begin the restoration for the new museum. Rogers is experiencing amazing growth and excitement as our business and city leaders work together to revitalize the historic downtown. 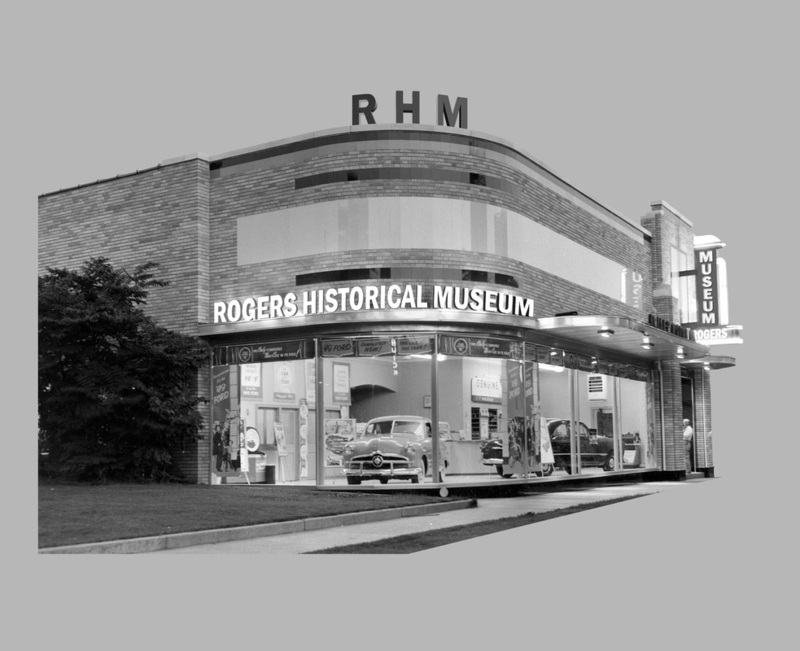 The new state-of-the-art, family friendly, Rogers Historical Museum will be a cornerstone and showplace and will complement the other outstanding museums and attractions in Northwest Arkansas. 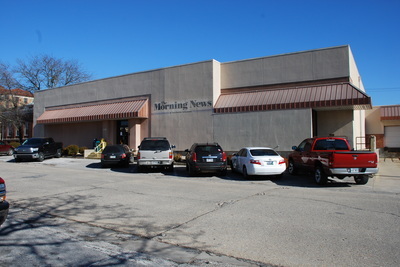 The City of Rogers acquired the Morning News Building for the museum expansion. 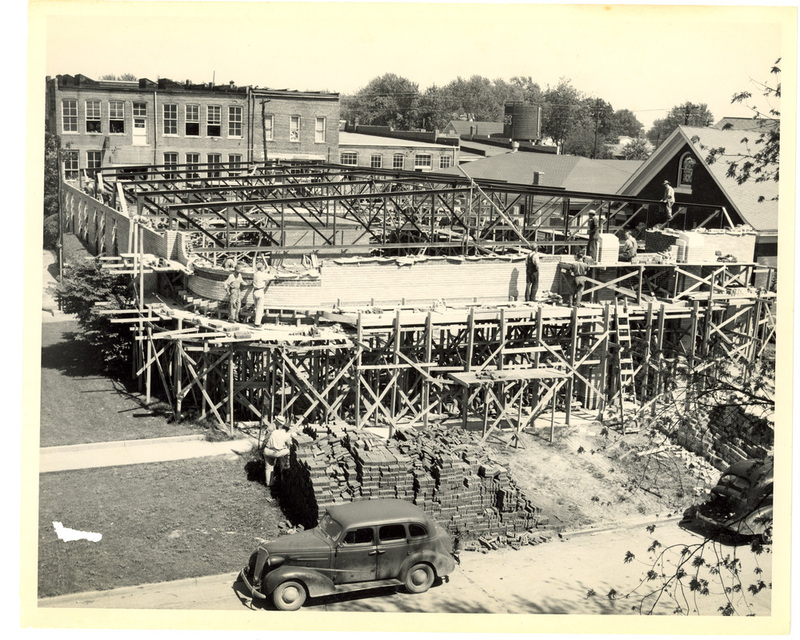 The historic building will be restored to its original 1947 appearance and house galleries, exhibits, and gift shop. This depiction of the new museum is by David Hook, Rogers Facilities Manager. Are you a lover of Rogers and our history? Join the Friends and help preserve our stories and memories. As a bonus you also get an immediate 25% discount on guns, books, and all gift shop items. Remember that your membership contribution is tax deductible. Click Here.